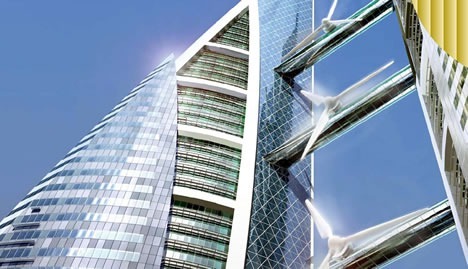 Three wind turbine blades have been successfully installed on the Bahrain World Trade Center, a twin skyscraper complex. This is the first time that a commercial development has integrated large-scale wind turbines within its design to harness the power of the wind. The three massive turbines, measuring 29 meters in diameter, are supported by bridges spanning between the complex’s two towers. Through its positioning and the unique aerodynamic design of the towers, the prevailing on-shore Gulf breeze is funneled into the path of the turbines, helping to create power generation efficiency. Once operational, the wind turbines will deliver approximately 11-15% of the energy needs of the building, or 1100 to 1300 megawatt-hours per year — enough to provide light in 300 homes for over a year.